So I’ve spent a lot of time in my grandparents basement. 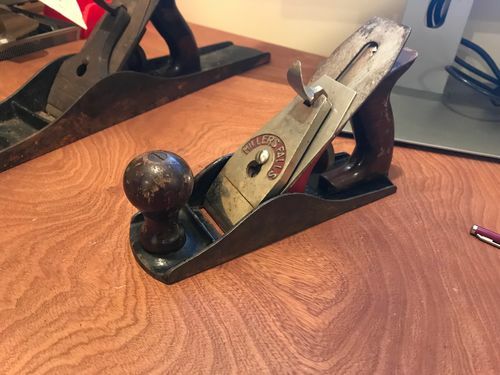 I’ve done some digging through his workbench (which is covered with 30 years of accumulated odds and ends) but this christmas I decided to dig harder and see if he had any hand planes. 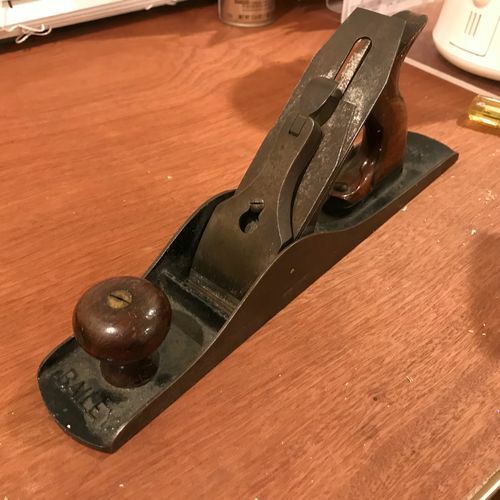 I’ve been scouring ebay and craigslist for the last year looking for some old hand planes so I can learn how to use them but have come up empty. Unbelievably, I found 6 buried in and around the old workbench. I can’t believe I hadn’t stumbled onto them before. They are definitely going to need some work to get them into working condition so hopefully you guys can give me some tips on how to clean them up and, well, how to use them properly.I have identified a few of them but the unmarked ones I will need some help with. My grandfather says that most of them were his fathers so I would imagine they are from the 30’s but that is a guess. Stanley Bailey #5. I’ve really been wanting one of these. Two block planes. Still haven’t taken them apart to look for marks. I would like to get these things as clean and protected as I can but I am really dying to use them so we will see. I’ve used vinegar on some other rusted tools and it does the job but it leaves some black stains occasionally so I am going the citric acid route. It should arrive in the mail tomorrow. If anyone has any advice on how they restore old planes please chime in. Any info at all would be greatly appreciated. Here is a very informative site about restoring your hand planes, hope this helps. Have fun, make some dust. https://www.youtube.com/watch?v=RYyV6IUpsYk!https://s3.amazonaws.com/vs-lumberjocks.com/p1mcns9.jpg! Evapo-Rust is the best way to remove any rust. One gallon will be plenty, and you can reuse it many times before you have to get rid of it. It’s great stuff. As far as sharpening and tuning the planes, there are a ton of good YouTube videos on both topics. Regarding refurb, few are better at it (and have done more of them) than Don W here on LJs. His site is timetestedtools, check it out. All of those planes look to be in pretty good shape. Not much rust compared to many I’ve refurbed. 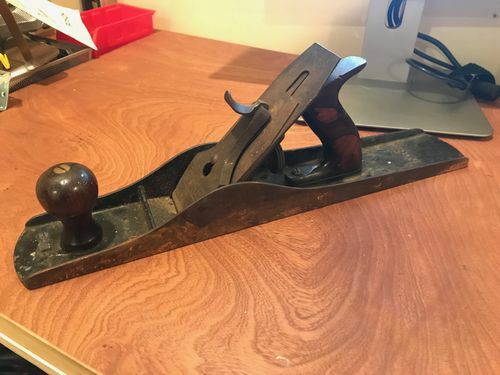 The Stanley Bailey and Miller’s Falls planes are very good one’s, and the the other bench plane may be. Not sure which block planes those are, possibly a 120 and the double ended 130. Worth refurbing for sentimental value and will be ok to use. Evaporust is really easy and works great – how to here. Once cleaned up, here is a tune up series, including sharpening. I don’t use the totes because they don’t fit my large hands. Here's some drawings if interested. If you’ve never heard of Patrick Leach’s The Superior Works: Patrick's Blood and Gore, it is worth taking a look at. 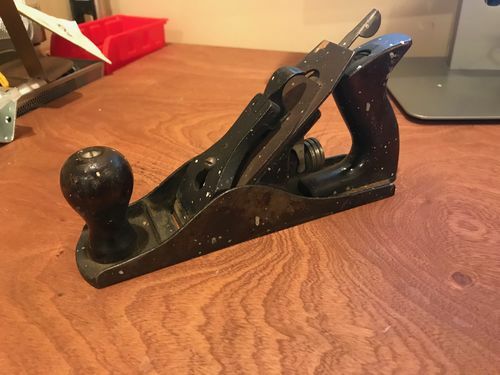 Details on virtually all Stanley planes. FWIW, sometimes, when you want to keep the original japanning, you can clean up the base using a wire wheel on a drill press. You can then choose your rust removal method with the remaining metal parts. IMO, that japanning looks too good to replace at the moment… Just my 2-cents worth. Clarkie, I’ve read and watched a lot of Paul sellers stuff over the last few months. I might be mistaken but I think he uses electrolysis for rust removal. I might give that a try down the line. Jonah, I’ve heard a lot of good things about evaporust. There seems to be a battle between evaporust, vinegar and electrolysis. If I’m not satisfied with the citric acid it is next on the list. Smitty, I’m a big fan of TimeTestedTools in fact I stayed up way too late last night on that site. Nice to know he’s on LJ. that site has been helpful, among others, in ID’ing these planes. Another aspect of restoring planes is the choice of oil or lubricantion after the rust has been cleaned up. Lots of differing opinions. I’d be interested to hear what everyone is using to keep the rust at bay. Definitely familiar with superior works. Love that site. That other plane that is unmarked is somekind of no. 1 plane. Trying to figure out the manufacturer but no luck yet. Unfortunately, I don’t think it’s a Stanley no. 1 though. 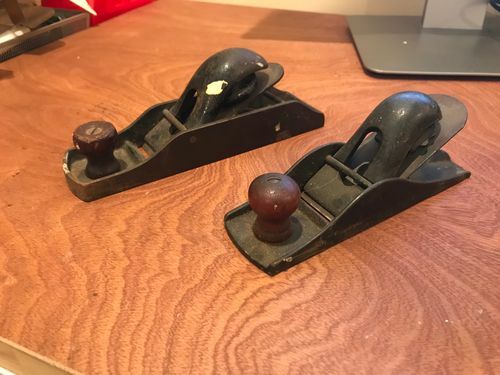 From what I’ve read they actually aren’t very good planes but oddly enough they are prized by collectors if they are Stanley’s. I read last night about a no soak process that uses WD40 and a wire brush (the tooth brush kind) on the base and a wire brush (the dremel type) on the smaller parts. He does the whole thing in a similar fashion. I can’t remember what site it is on but it is one of the main hand plane sites. I’m not planning on stripping the japanning on any of them. Aside from some chips here and there they all look to be in good shape. All of the totes and knobs are in one piece as well. Though some are scratched up covered in paint drops so I’ll have to figure out what to do about that. If any one has an oil or lubricant to recommend let me know. I use paste wax at random intervals to keep rust off but some prefer jojoba oil. As to the paint drops a little murphys oil on some #0000 steel wool should pop them right off and clean up what youve got. I dont use any oil, just collects sawdust. Paste wax everywhere provides all the lube needed. I used Alox on all cast surfaces to prevent rust. I’ve restored around 50 planes and I used a vinegar bath on all but 2. I use Citric Acid on old saws- the jelly stuff. I tried it on one plane and wasn’t impressed. IMO WD40 and a wire brush is the worst method, too much elbow grease for inferior results. You can leave a plane in Vinegar for a week without affecting the japanning. I’m not sure if that is true for Citric Acid, you might want to start on those block planes to be safe. After you have soaked in vinegar and removed the rust what do you apply afterwards? I’ll have to give paste wax a try. I’m guessing Johnson’s will do? Do you just wipe it on and do a little buffing? This guy uses mineral spirits and a toothbrush to clean off everything and then moves on to citric acid. Fine wire wheel first then MS and a toothbrush to get any oil and loose crud off. I used to use citric acid but swapped to evaporust. I’ve had my 32 oz jug for 2 years and it still works. Not like new but I figure I definitely got my 10$ worth a couple times over. If it’s light rust I just wire wheel it off. Otherwise it’s WW then Evaporust then WW again then Johnson’s. Or WD40 or 3 in 1 or the many other options out there. When I pull the planes out of a vinegar bath I wipe the rust/grime off with steel wool, then I hit is with a little WD40 to chase the moisture away. Once everything is clean and dry I assemble and put on a coat of Johnson’s Paste wax. There may be better waxes or oils to prevent rust, but it is plenty for my climate. I live in the high desert, the air here is VERY dry. I have a plane rag / shop rag that is loaded with WD40; that is what the planes get wiped down with. There is nothing in that group rusted enough to warrant any kind of acid. Clean them up and tune them. If you want a little more shine use rust eraser or steel wool with wd-40. A fine wire wheel will work as well.